When we crossed the Causeway, we were expecting to see the Johor we knew. The vast land, the terrace houses leading up to Johor Bharu. We anticipated the familiar sight of the yellow “bus sekolah” [school bus] on the weekdays and the old shop houses selling anything and everything. But the Iskandar region is different. The border town, three times the size of Singapore, has become almost an extension of home for many Singaporeans. Set across 2217 sq km at the southern-most part of Johor, Iskandar is a joint project by the Malaysian government and the local government of Johor. It aims to be one of the largest fully integrated urban developments in southern Asia. Hwang-DBS Vickers Research predicts a surge in residential properties in the Iskandar region, with 9,000 new units in Danga Bay alone. Within the first month of their launch, 3300 units were sold to foreigners. 50 per cent of the foreign buyers are Singaporeans. Jeremy Hoon, 58, is one of them. Hoon came to Iskandar in 2013. He bought a 3,000-sq ft double-storey terrace house in Horizon Hills. He travels several times a week to Singapore and works as a business adviser after he retired last year. The ex-partner of KPMG Singapore says the township allows a seamless cross-border life. “If you rent out your house and move here, you can easily purchase a unit in Iskandar. If you have a car, you can easily commute to work in Singapore every day,” he says, citing that it only takes 10 minutes to the border of Singapore outside peak hours. The prices of homes where Hoon lives range from RM600-RM1000 per square feet. Like Hoon, Danny Chua, 45, has also invested in Iskandar. 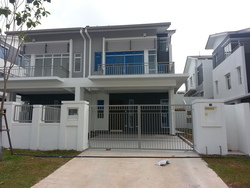 Since 2011, the ex-banker has bought about a dozen landed houses in Nusajaya, Iskandar. “From my observation, there are 70 per cent Singaporeans and 30 per cent upper middle-class to upper class Malaysians here [Horizon Hills],” the property agent says. Kuala Lumpur people call this place [Johor] ‘Greater Singapore’ because in KL you have inner KL and beyond that you call it greater KL,” he says. He gestures at the new spacious bungalows set on top of a neatly trimmed hill-scape of Horizon Hills. He is now a property agent in Johor. He helps Singaporeans purchase or rent residential units in the Iskandar region. “People are pushed out of Singapore,” says Chua. “With the eight cooling measures, high stamp duty and total debt service ratio, Singaporeans find it almost unaffordable to invest in residential property in Singapore and it is impossible to get a loan,” he adds. Hwang-DBS Vickers Research notes that recent launches in Nusajaya, Medini and Danga Bay within the Iskandar region have reached an all-time high of 45 per cent in the last five years; the country’s residential property price surged at 30 per cent. “I have an ex-colleague who found the costs of living in Singapore too high. She sold her flat and came to Iskandar,” he says. She had a four-room flat in Sengkang. With the cash, she bought a landed double-storey terrace house here,” Chua says. Like his ex-colleague, Chua now spends a big portion of his time in Johor, travelling back to see his teenage children in Singapore once a week. “Many people say that Johor is not safe but I live here and I know this part of Malaysia is as safe as Singapore,” Chua adds. Horizon Hills, where Chua lives, is also a heavily gated community with security guards and high wire-fences. “Don’t be too showy,” he advises. “You cannot just leave your phone on the table and walk away like we do in Singapore. We like putting the phone on the coffee shop table and walking over to make an order [in Singapore],” he says. Chua believes that only the middle class Singaporeans are interested in living in Iskandar. “They have a little bit of savings and they can come here to start a small investment in houses or rent a unit. The lower-end Singaporeans are not going to be interested because they are already having trouble making ends meet. The upper class Singaporeans are not interested at all. They are well-off in Singapore and they can afford most things in Singapore. Expanding your money 2.6 times ($1=RM2.6) makes no difference to them,” Chua says. Yet life in the gated communities in Iskandar is rather secluded from the larger community of Johor. Chua and Hoon both said their neighbours are mainly Singaporeans and if they mix with Malaysians, they are usually form the richer part of society. Another Singaporean who bought a home in Johor in 2006, Ameerali Abdeali, said Singaporeans living in Johor should not be too arrogant. “Look, the prices are shooting up because of the Singaporeans living here. They are coming here and they say, ‘cheap this and cheap that’ and they are pushing up the prices. There is no such thing as ‘cheap’, you know. It is just more affordable for Singaporeans because of the exchange rate,” the 63-year-old says. He owns a three-bedroom apartment in Perling, Johor. “If they go to the bazaar, they should bargain like the locals. They should not just spend however they wish because of the exchange rate,” the Managing Director of GetIT Communications Pte Ltd says. Semi-retired and also the president of the Muslim Kidney Action Association of Singapore, Ameerali and his wife look forward to the day they can retire in Malaysia. “You only need to see someone washing their car and you greet them. Chances are he will invite you over. The wife will give you some pineapple tarts. Very nice,” he says, of the handful of times he was invited over to his neighbours’ homes.